I put a call out on Twitter for a recommendation for somewhere in Bristol to have lunch for Mothering Sunday after missing out on a spot at Jamie's Italian. Many places were suggested but ultimately, we went with Piccolino's which didn't really work all that well for us. A suggestion was made to go to the Thali Café - which seemed like an interesting option but I didn't really feel it fitted with the Sunday lunch vibe that I was going for. So, we decided to go on Saturday evening instead. We even walked all the way there and back - which I didn't thank myself for on Sunday...! The Thali Café is a little spot on the edge of Clifton before the sheer drop down to Hotwells. Interestingly, it was a site used by The Restaurant for the runners up who had 'Rags to Riches' as a concept. The site is an interesting one, with little corners and a real intimate feel - there was a really interesting selection of conversations going on around us and people regularly arriving to fill up their tiffin boxes. It was busy - we were pleased to get a table as people just after us had to wait for a little while. There is definite restaurant atmosphere there and at the same time, you feel like you're in the living room of a friend who is still embracing the student lifestyle - if they also happen to have a few sepia photographs dotted around. There is a reasonable list of drinks if you want something alcoholic, including a good range of cocktails that I would have loved to avail myself of. I was a little disappointed that they didn't have any non-alcoholic ones and in fact, the soft drinks list was very short. I got an apple juice and lemonade in the end - not on the menu but made with no fuss. We opted to start with a poppadom each and they were out in double quick time - but not greasy and didn't feel like they had been left for some time as they waited to be ordered. They were actually so tasty we ordered a second batch - partially because the homemade chutneys were so tasty that we wanted to enjoy it all. The homemade chutneys - all fresh and full of flavour - mango at the top, then raita, then tomato and tamarind and finished off with a coconut based one at the bottom - this last was my absolute favourite and was gone far too quickly! After this we shared some Punjabi samosas, although we could have opted for nearly anything from the starter menu. Next time we might opt for the mixed starter with pakora and bonda - a potato based snack. Again, these were gone just that little bit too quickly but they were packed with Indian spices that still allowed the freshness of the vegetables to come through. The pastry was also light and crunchy - just what you want from a samosa. Finally, you go to the Thali Café, you probably ought to actually have a thali. As mentioned in my round up of The Bristol Good Food Awards last week, it's a little bit messier than my favourite Indian restaurant Meluha but that's okay. You have a good taste of a variety of curries, some I wouldn't go for normally. This is the Northern thali. Clockwise from the top it features basmati rice, tarka dal, Rajasthani pumpkin curry, crunchy Keralan salad, saag paneer and in the middle raita. I have to be honest with you, this dish has made me reconsider sharing my own dal recipe. It just isn't right yet. My dal is too thick and probably not garlicky enough. Although D did manage to polish it all off so it's not all bad... Anyway, sidetrack! This isn't the best tarka dal I've ever had - sadly, this came from New Greenham Tandoori (which is a bit far away for a takeaway these days), closely followed by the now defunct Everest 53 (no link as they are gone gone gone). It was pretty good though. The pumpkin curry was an unusual one - I always like to see different vegetables in my meals and I might see if I can have a go at making something similar in the future. The salad was excellent, crispy, crunchy and making good use of radishes and seeds - it was a welcome different texture. I was a little disappointed by the paneer - I didn't feel that it was made as much of the star of the show as I like. That's a personal preference though. The sauce, for me, didn't quite work. A small moan though as the meal all in all was a very favourable one. The staff were busy but attentive and the thali beer, I'm told, was met very favourably by Mr K.
The Thali Café is a small chain, with restaurants throughout Bristol. I definitely recommend it for an informal intimate gathering. It's another one I'd quite like to visit with D at some point - and I think there is enough range there that Mr K's mum (I need to think of a better way to refer to her!) would have a milder option. The meal in total came to around £30. 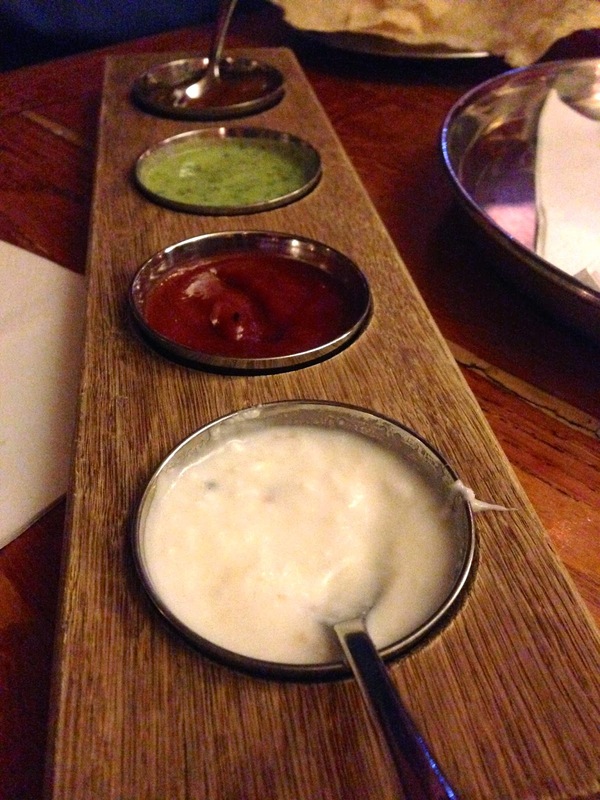 Given the range of different curries we had - Mr K had the Mogul thali - and the starters as well, it wasn't too bad a price.